NORTH ANDOVER, Mass. 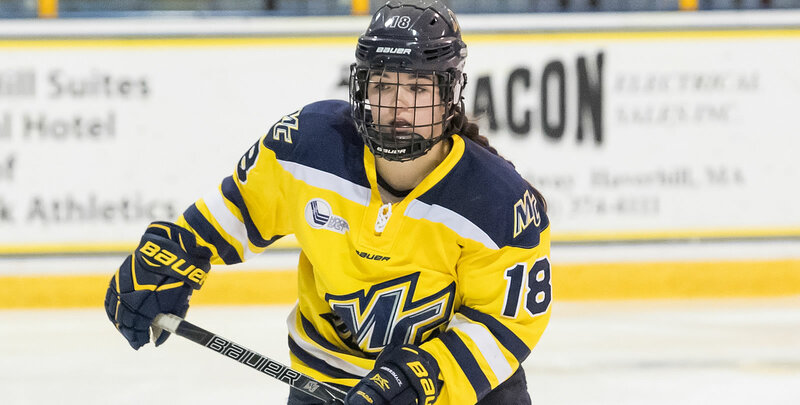 - The Merrimack College women's ice hockey program concluded their season series against Union Saturday, September 29, with a 4-1 home victory to improve to 2-0-0. Score: Merrimack 4, Union 1 Records: Merrimack (2-0-0) | Union (0-2-0) Location: Lawler Rink | North Andover, Mass. Goal #1 (MC 1-0) - Senior Katelyn Rae continued her hot start, using just a minute and four seconds to give the Warriors a 1-0 lead. Freshman Gabby Jones picked up her first collegiate point after finding Rae just outside the crease on a backdoor cut, and the easy finish put Merrimack on the board. Goal #2 (UNION 1-1) - The Dutchmen put their first goal of the season in with five minutes left in the first, when a neutral zone turnover led to a scoring opportunity. After the initial shot was blocked, Alli First found it on her stick at the top of the slot, and buried it to level the score. Goal #3 (MC 2-1) - Halfway through the second period, senior Mikyla Grant-Mentis took another feed from Jones to retake the lead. Jones had the puck just behind the net, and slid a perfect pass to Grant-Mentis in the slot for the one-timer. Goal #4 (MC 3-1) - Freshman Kiki Roust picked up her first career point on an assist to extend the Warriors' lead. A pass from just inside the blue line found Rae, who turned in from the left face-off circle and fired a backhand missile through the five-hole. Goal #5 (MC 4-1) - Grant-Mentis capped off the afternoon with an empty-net goal after a Jones turnover and feed gave her a sheet of empty ice. - Eight Merrimack players have tallied at least one point through the opening two games, with three players sitting at three points (Rae, Grant-Mentis, Jones). - Seven goals through the first two games is the most in any season-opening series in program history. - Senior Samantha Ridgewell holds a .981 save percentage, allowing just one goal while stopping 52 shots. Merrimack takes its first road trip of the year Friday, October 5, as it plays the first of two games against Penn State. Puck drop is slated for 6 p.m.